High-speed file transfer from card to computer to dramatically accelerate workflow. 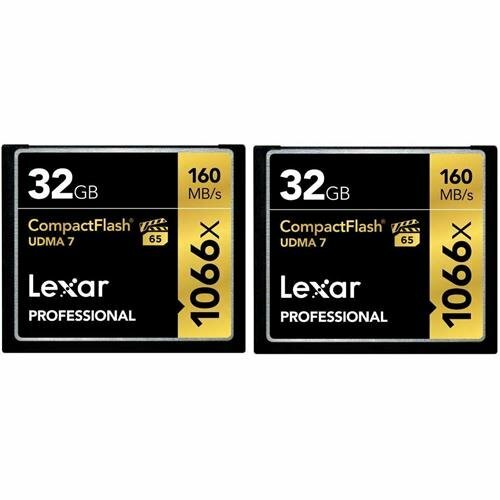 Capture high-quality images and HD video with professional-level speeds and capacities, the Lexar Professional 1066x CompactFlash card lets you quickly capture and transfer high-quality photos and 1080p full-hd, 3D, and 4K video, with a read transfer speed up to 1066x (160mb/s). And you'll power through post-production with high-speed card-to-computer file transfer. This dramatically accelerates workflow from start to finish, so you can save time and get back to the business of photography. Improve capture, transfer, and workflow high-speed performance you can trust. Whether you're a professional photographer, videographer, or enthusiast, the card provides performance you can trust. It leverages UDMA 7 technology to provide a read transfer speed up to 1066x (160mb/s). Verbatim has been a leader in data storage technology since 1969, and guarantees this product with a Lifetime limited warranty and technical support. SanDisk Ultra CompactFlash memory cards deliver the ideal combination of reliability, value, and performance for casual photographers with entry to mid-range DSLRs. Choose from a range of capacities up to 32GB to do more without worrying about running out of space. Capture the moment with ultra fast shot speeds and save time moving files to your computer with transfer speeds of up to 50MB/s (8GB - 32GB). 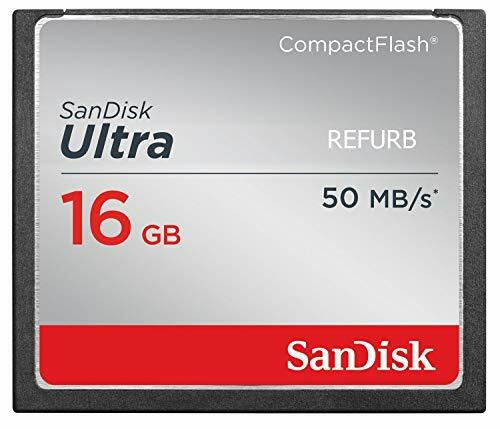 For dependability and solid performance, you can count on SanDisk Ultra CompactFlash memory cards to capture and store your favorite pictures and videos. That's why for memories that can't be missed, photographers worldwide choose SanDisk. Up to 50MB/s read speed; write speed lower (8GB-16GB). Up to 25MB/s read speed; write speed lower (4GB). Based on internal testing; performance may be lower depending upon host device. 1MB = 1,000,000 bytes. 1GB=1,000,000,000 bytes. Actual user storage less. Full HD (1920x1080x30fps), 3D or 4K video support may vary based on host device, file size, resolution, compression, bit rate, content and other factors. This Certified Refurbished product is tested and certified by the manufacturer or by a third-party refurbisher to look and work like new, with limited to no signs of wear. The refurbishing process includes functionality testing, inspection, reconditioning and repackaging. The product ships with all relevant accessories, a minimum 90-day warranty, and may arrive in a generic white or brown box. 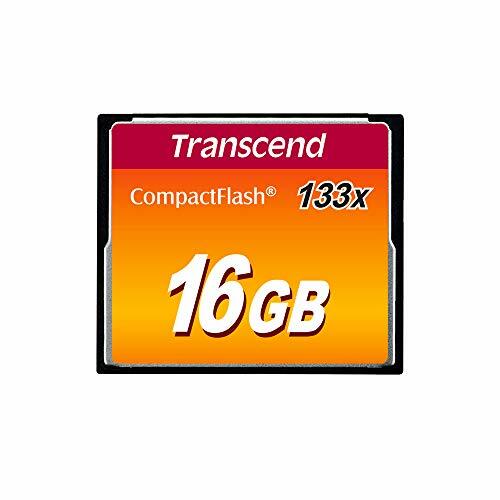 Transcend CompactFlash 133 cards are fast, reliable, and high-capacity. With consistent performance and vast storage capacity, Transcend CompactFlash 133 cards are the perfect match for enthusiast and presume level DSLR cameras and camcorders. Additionally, the top-tier MLC NAND flash chips inside are durable and reliable. Let your epic journey be the dream of film scores. HYPERCORE Series CFast 2.0 fuel the most demanding DSLRs & Cinematic Cameras. 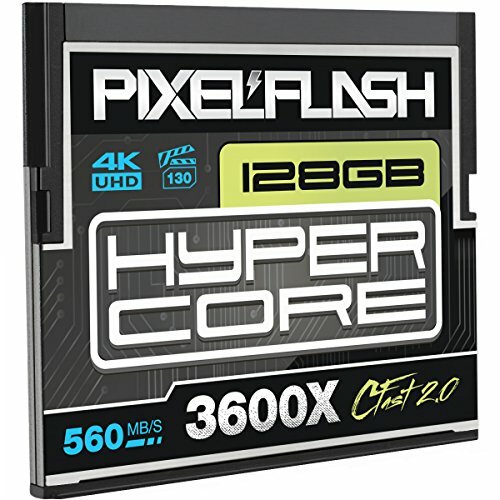 PixelFlash Hypercore Series memory cards provide dependable 4k/8k UHD video recording as well as High Speed data writing (560 MB/s) and transfer speed (540 MB/s) to improve your work flow efficiency. HyperCore CFast Memory Cards easily keep up with the shooting speed of your camera, clearing the buffer faster than ever before. This combination of power, speed and reliability is the ideal fuel for both DSLR users and video professionals world wide. Capture the world through your lens with the help of our high-capacity 128gb CFast 2.0 Cards and store all of your best photography and videography without worry! Compatibility Our CFast Cards are compatible with the following camera models - Atomos Ninja Star, BlackMagic URSA 4K and BlackMagic URSA Mini 4.6k (note that only our 128GB card is compatible with the URSA Mini 4.6K), Canon C200/C200B, Canon 1DX Mark II, Canon XC10*, Canon EOS-1D X Mark II, Hasselblad H6D-50c, Hasselblad H6D-100c, PHANTOM VEO S, Phase One iQ3, and Phase One XF. Our testing has confirmed compatibility with the Canon C300 Mark II & PL at maximum data recording settings (4k recording settings used: 4096x2160 | YCbCr 4:2:2, 10 bit | 410 Mbps, Intra-frame | 29.97P & 23.98P AND 2048x1080 | 59.94P & 59.94i2). Please note that we are currently in testing phase with all of the most demanding cinematic video cameras on the market. Until finished, we do not claim compatibility of this card with the following camera models: Canon XC15, Canon C700, and all ARRI Brand Cameras. *Always format/initialize card before use with the Canon XC10, and all cameras as a best practice. 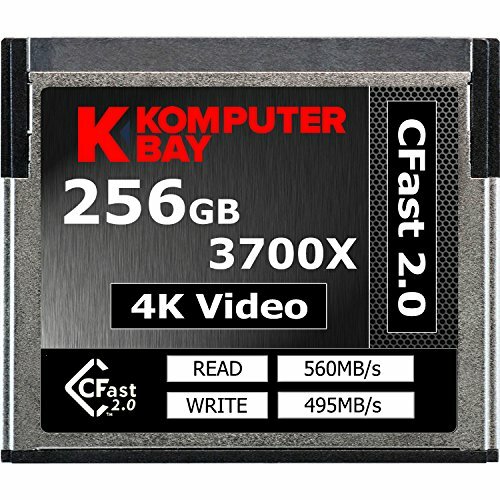 VIDEO PERFORMANCE GUARANTEE: 128GB CFast 2.0 from PixelFlash - True VPG-130. Matches or Exceeds Lexar and Sandisk in quality & speed. Guaranteed. DSI(TM) LABORATORY CERTIFIED FLASH MEMORY: 100% Free of Errors and Defects - Never receive a faulty memory card again! 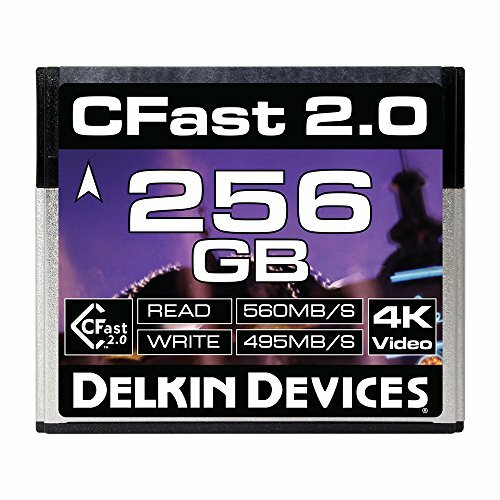 "The Delkin Devices Cinema CFast 2.0 memory card is a specialized storage medium designed for and tested with leading CFast 2.0 cinema cameras & recorders, including Canon, Blackmagic & Atomos. Utilizing the latest flash memory with a SATA III interface, the Cinema CFast 2.0 memory card delivers fast, reliable video capture at speeds up to 495MB/s. Capture flawless DCI 4K Video at 60 fps or Full HD at 120 fps, as well as unlimited JPEG & 170 full-sized RAW images at 16 fps in the Canon EOS-1D X Mark II. 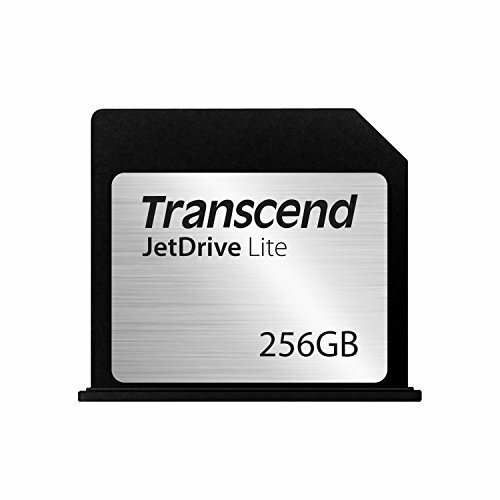 The card also offers transfer speeds reaching an astounding 560MB/s, streamlining your workflow and ensuring the quickest, most efficient data transfer from card to computer. With built-in wear leveling, bad block detection and error correction, the Cinema CFast 2.0 memory card is designed to ensure data integrity and trustworthy storage for your valuable files. Important Notice: Cards may require a deep format to support continuous 4K video recording in some 4K video capable cameras. This issue is not exclusive to Delkin branded CFast memory cards and applies to several brands of CFast memory cards when used in this particular mode in particular host devices (e.g. Canon EOS 1D X Mark II). It is recommended that CFast memory cards be deep formatted before use, and also regularly as part of proper card maintenance." 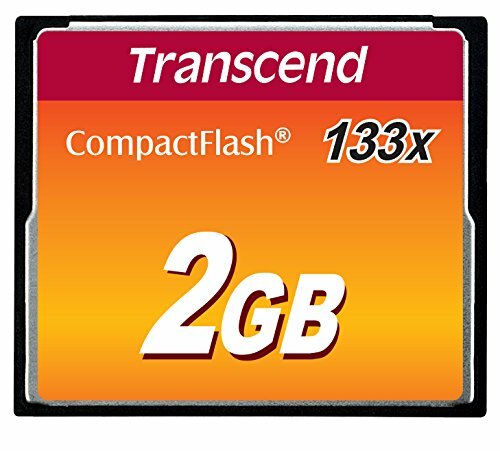 32GB High-Speed CF CompactFlash memory card. Speed rating of 800X - read speed up to 120MB/sec and write speed up to 40MB/sec. Ideal for advanced camcorders and DSLR cameras. Supports UDMA 7 and meets VPG-20 specifications. Pete the Cat Flash Cards offer an engaging and on-the-go approach to teaching your little one new words and meanings. The inclusion of 10 colorful and double-sided flashcards with fun graphics allow your child to associate meaning to objects through visual stimulation. The colors and shapes used on the cards not only make learning a fun playtime activity but the plastic ring that holds the cards together opens and closes for easy removal and storage. 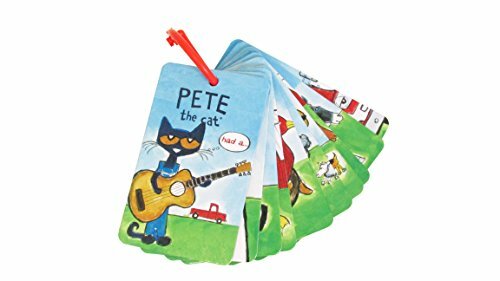 Pete the Cat Flash Cards allow your child the opportunity to learn anywhere. FLASH CARDS: Help kids learn words anywhere with fun and portable Pete the Cat flashcards. Featuring fun artwork from Pete the Cat Books, your child can learn new words in an engaging way. 10 DOUBLE SIDED CARDS: Colorful & varied designs give the opportunity to teach words, colors, animals, and common nouns. This set is a great educational toy for toddlers & kids ages 6 months and up. KEEP KIDS ENGAGED: Perfect for entertaining children in cars, planes, on trips to the doctor's office and more. Cards are on a handy ring that can be tossed in your bag to carry anywhere. LEARNING TOY: Older babies are visually stimulated and begin word recognition, 1 - 2 - 3 year olds begin to learn colors, animals, sounds, and everyday nouns, and object recognition. PETE THE CAT: A black cat known for his positive thinking & love of groovy music teaches kids about facing challenges & learning new things. Inspired by Pete the Cat Books by Eric Litwin & James Dean. 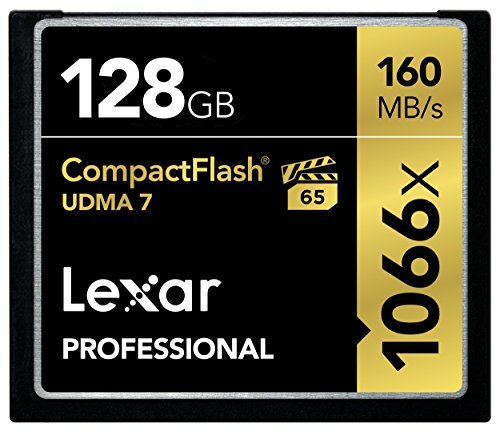 Designed to address the needs of professional photographers, videographers, and enthusiasts, The Lexar professional 1066x CompactFlash card let you quickly capture high-quality images and 1080P full-HD, 3D, and 4K video. This card leverages UDMA 7 technology to deliver a read transfer Speed up to 1066x (160MB/s). and you'll power through post-production with high-speed card-to-computer file transfer. This dramatically accelerates workflow from start to finish, so you can save time and get back to the business of photography. The card support vpg-65 and is backed by expert technical support and a limited lifetime warranty. Take more high-resolution pictures at ultra-fast speeds (up to 120MB/sec. read, 40MB/sec. write) with this Transcend 64GB 800x UDMA7 CompactFlash (CF) Card memory card. 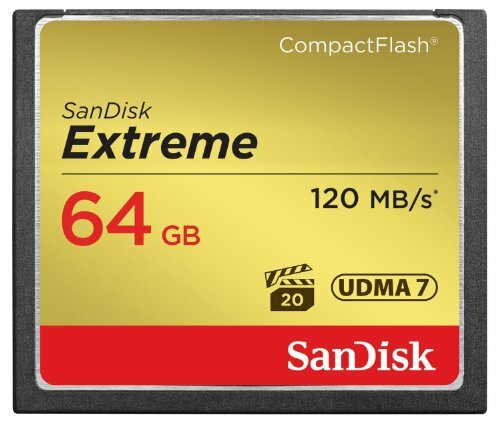 The optimal combination of shot speed (up to 60MB/s), sustained video performance guarantee (VPG-20), and transfer speed (up to 120MB/s; 16GB - 128GB cards only.) 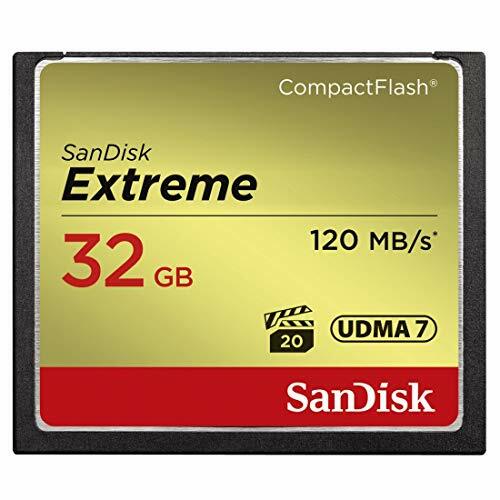 ideal for use with mid-range to high-end DSLR cameras and HD camcorders, the SanDisk extreme CompactFlash memory card delivers first- rate read/write speeds to catch fast action shots and enable quick file transfers. 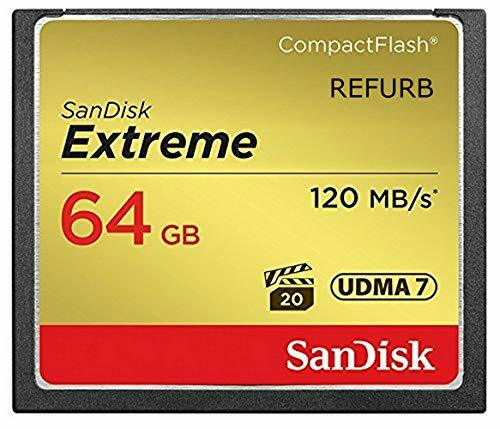 This memory card features video performance guarantee (VPG-20) to deliver a minimum sustained recording data rate of 20MB/s to support high- quality full HD video (1080P) recording. Take advantage of burst-mode photography with the card's write speeds of up to 60MB/s (400X) and enjoy efficient workflow with its transfer speeds up to 120MB/s (16GB - 128GB cards only). 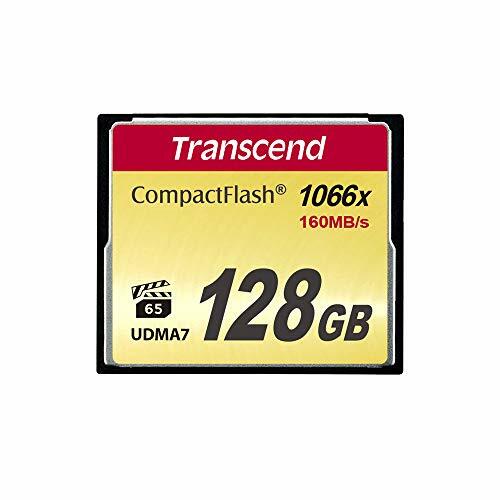 with capacities up to 128GB, this memory card provides plenty of storage for full HD videos and RAW photos. To ensure high-quality image and video capture using today s cutting-edge digital equipment, Transcend s 1000x CompactFlash memory cards support the CompactFlash 6.0 specification. 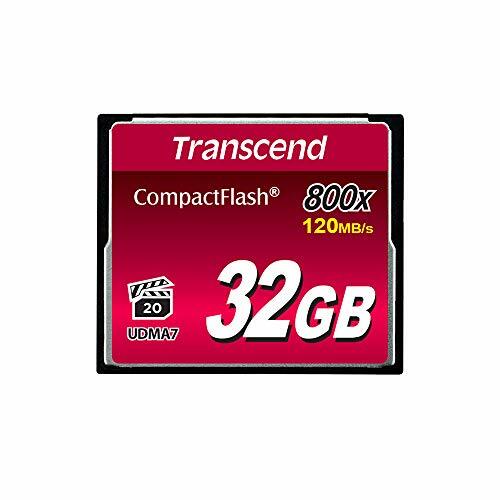 Manufactured with brand-name toggle mode MLC NAND Flash chips, Transcend s 1000x CompactFlash memory cards offer high-speed performance and vast storage space. 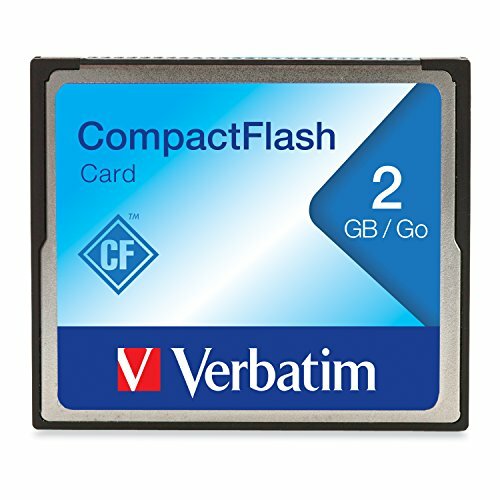 Additionally, the "Ultimate" series 1000x CompactFlash cards implement the Video Performance Guarantee (VPG-20) to enable professional-quality video recording without dropping frames, even in 3D.